A self-proclaimed social justice advocate, Parker’s excuse for her abhorrent behavior was that she wanted to use her privilege as a white woman to stand up for those who are living in fear of Trump. She used this privilege, of course, in an area that is predominantly white. Is verbally assaulting, stalking, and doxxing an elderly Jewish man ever acceptable? According to Palo Alto Bernie Sanders fanatic Melissa Parker Mankey, it is. This kind of behavior has become increasingly common as more Liberals have become hooked on the immediate gratification of attacking strangers for likes and selfies. What Mankey did was typical to a point, but her attack took a unique turn when the music store accountant decided to urge other total strangers in the Starbucks location to join her in attacking this stranger who had not done anything wrong to them. After Mankey failed to find back-up in the “fellow white people” she claimed “broke her heart” because they wouldn’t become accomplices to a hate crime, the mohawk-sporting imbecile followed the elderly man out to the parking lot. There her tirade continued after she vowed the man would have “nowhere to hide.” She also boasted of calling him a “wimp” when he didn’t fight back, as if there is no reason other than personal wimpiness that someone might choose not to engage with someone as charming as she is. Once they were alone in the parking lot, Mankey took photos of the man and posted them on social media, where she encouraged others to hunt him down, find out where he lives, and harass him. 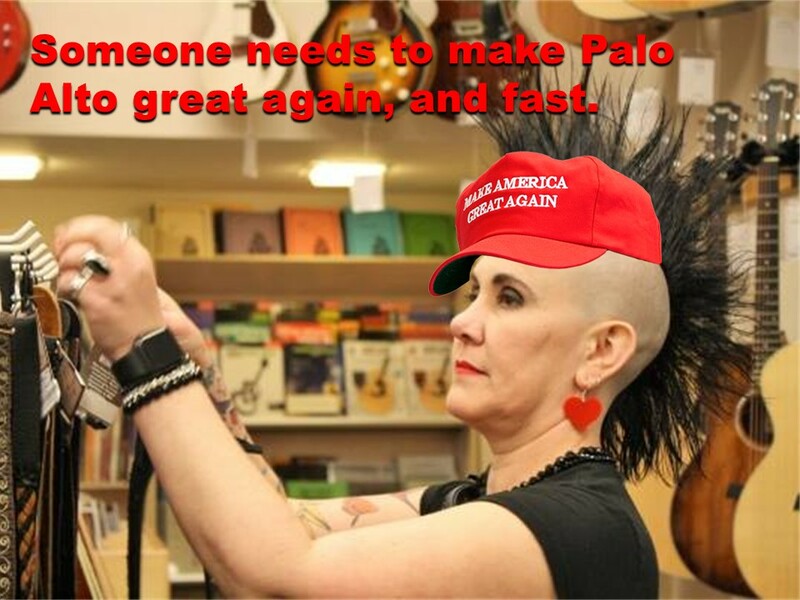 In one post she wrote, “Anybody in Palo Alto know this freak?” She then went on to accuse anyone who did not join her in her hate crime of helping the country slip into fascism. The man threatened to call the police, and Mankey left, but later on when she returned and found the man there her tirade began anew. According to the latest demographics, 1.9% of Palo Alto’s residents are Black. All non-whites combined represent only 14.9% of the population. Statistically it is highly unlikely there were more than a handful of people in that Starbucks at that moment who were not white. To suggest that the Starbucks or any other location this man visited that day was filled with terrified brown people is the bizarre concoction of someone who pays a lot of money to live in a city where there aren’t many. How thoughtful of Mankey to speak on the behalf of brown people when she wasn’t asked to. If Mankey wants to stage a workplace protest in the future, she’ll have to find this elderly man’s workplace, because she can’t do it at her own job. Luckily for the other people in the Starbucks, they declined to join in, and that is why they are still employed. Mankey, predictably, is not. As for her call to attack this man on social media, this backfired on Mankey as well. She has had to delete her social media accounts after the backlash didn’t go in her favor. The man who was attacked in this incident wears his MAGA hat regularly, but other Conservatives of all races have expressed fears that they will be similarly attacked if they do so as well. With lunatics like Mankey loose in our society, can you blame them? Want to meet real Patriots for uncensored, Liberal-free talk? Join me, Rob Raskin of Las Vegas, at ProAmericaOnly.org. I started PAO so real American Patriots would have a place where their voices can be heard, without the censorship and banning we experience on other sites. We’re social media that puts America first, and we need great Patriots like YOU to help us MAGA. Looking for a Searchable Mueller Report? You’ve found it!